In the summer of 1918 civic leaders in Neath had pulled off a bit of a coup. David Lloyd George, a radical Welsh Liberal and reforming Chancellor of the Exchequer, had become Prime Minister in 1916. He was said to have transformed the War effort and was the dominant political figure of the time. He was also a great supporter of the National Eisteddfod, which would be coming to town in August. Some councils had already honoured him but was not this an opportunity to leapfrog other Welsh municipalities and make Lloyd George a Freeman of the Borough of Neath? A Council meeting supported the proposal on 18th June and the Clerk wrote to 10 Downing Street the following day. The response was prompt – the Prime Minister had accepted. The Freedom of the Borough was, of course, nothing more than a formality in itself. However, it fixes in time the two days of the visit and, through what we would now call media reporting, provides us with some interesting impressions of the town albeit in unusual circumstances. The Town Clerk’s letter refers to the service of the Prime Minister in 'the present great crisis', this was of course a military crisis and the resolution, or progress toward the resolution of that crisis set the mood for the visit. To simplify the situation, we can say that Germany had been fighting on two fronts throughout the conflict but, when revolution took Russia out of the war, it was possible for its high command to direct all available force against the Allies in the west; it was a time-limited opportunity to win the War before the manpower of the United States arrived in huge but untested numbers. In the spring of 1918, in a succession of offences, Germany threw everything that it had against the French and British armies; it made large territorial gains and almost gained a strategic victory. However, the German army had exhausted itself in the process. When the invitation had been issued by Neath Corporation in June, the situation had stabilised but everything was still in the balance. The visit to Neath was originally timed so that the Prime Minister could attend some of the Eisteddfod sessions on Thursday, 8th August but, a few days earlier, the newspapers announced that his arrival would be delayed due to pressure of official business. Whatever Lloyd George did that morning, major events were unfolding on the Western Front. At 4:20am a short artillery barrage launched an assault by Canadian, Australian, British and French troops against German lines in what was later called the Battle of Amiens. By the time that Lloyd George reached Paddington station at 3:00pm, Parliament was being told that 7,000 prisoners had been taken and over 100 guns captured. Boarding his train, he was quoted as telling railway staff – “we are smashing through”. The Prime Minister, briefed by telegram at Cardiff station, addressed large crowds from the railway carriage door telling them that the Allies had won a great victory that morning. The newspapers estimated that thousands of people had gathered at the Neath station yard from where the Prime Minister would travel by car over to Maesygwernen, Morriston. This was the home of TJ Williams, the Liberal MP for Swansea District which, at the time, included Neath Borough. On the way he visited the Neath Abbey ruins which he referred to in his speech the following day. Earlier, on the day of the Prime Minister’s arrival, Winifred Coombe Tennant had been initiated into the Gorsedd of Bards in Victoria Gardens as 'Mam o Nedd'. She was moved at the fact that the audience at the ceremony had been reminded that she herself had lost her son Christopher whilst on service with the Welsh Guards. Whilst Winifred had other children, it is clear from her diary that Christopher, who she often addressed in her writings and in other ways, was clearly in her mind when she adopted her bardic name; she was not only a mother, but a bereaved mother - one of so many. 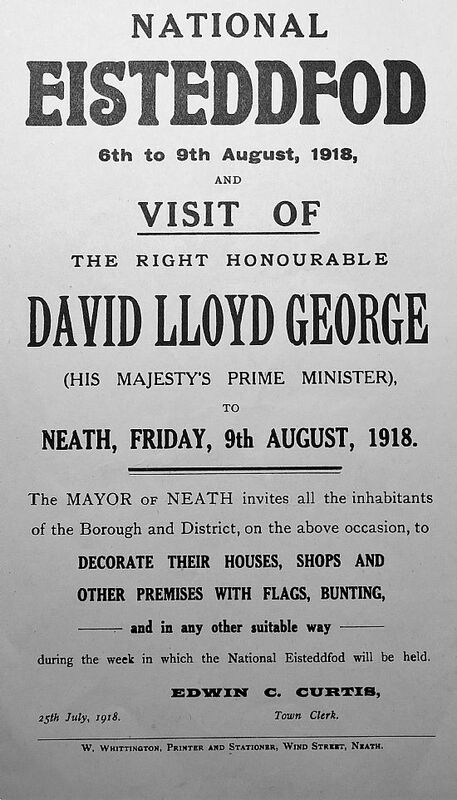 Lloyd George was to receive the Freedom of the Borough the following day, on Friday, 9th August, at the Gwyn Hall. One striking feature of the proceedings that Friday was the prominence of women involved in war work. Munitions workers participating in the procession were told to parade at the Briton Ferry tram terminus at half past eight or the Drill Hall at quarter past nine. It is interesting that the participation of the munitions and other female workers was organised by Phyllis Ayrton, south Wales organiser of the Women’s Party which had been founded by Christabel and Emmeline Pankhurst when they dissolved the Women's Social and political Union in 1917. It Advocated gender equality, but was also vigorously hostile to trade unions, striking miners, conscientious objectors and anyone with the most remote of family connections with Germany. Ayrton was an interesting woman: the child of a diplomat, she would be interred at Hong Kong by the Japanese during the Second World War. She had been responsible for organising female munitions workers into guards of honour elsewhere. We shouldn’t necessarily mix up the particular political programme of the Women’s Party with the munitions workers here; although no doubt they would have supported votes for women. 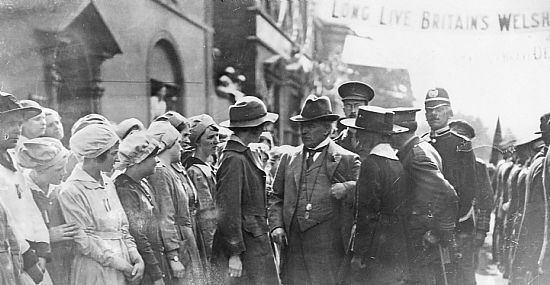 The Women’s Party had put some effort into trying to gain support in Briton Ferry, which was a notable stronghold of resistance to the War. 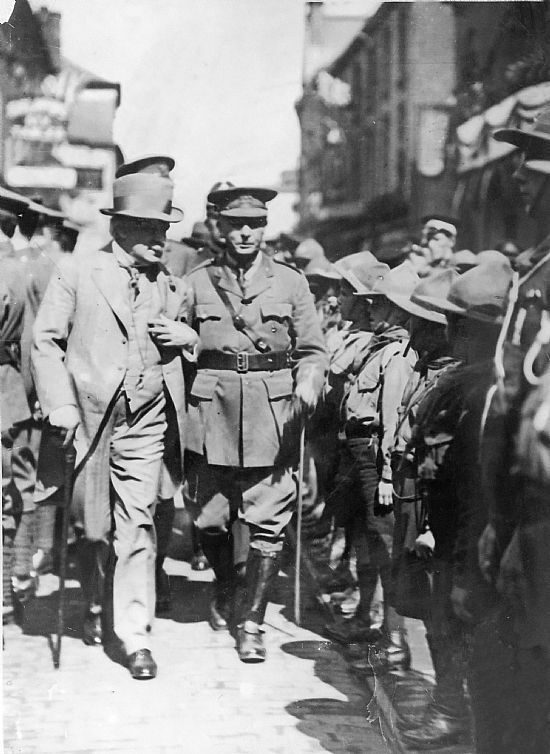 The Fifth Volunteer Battalion of the Welsh Regiment paraded at the Drill Hall at half past nine and formed into procession with the women workers and the Boy Scouts at Springfield. Lloyd George arrived shortly after at 10:00am and, after he had inspected the troops, the whole procession headed to the Gwyn Hall. While particular streets can be identified, the route around town is not clear from the surviving newsreel which may easily have been edited out of sequence. Either before or after the ceremony Lloyd Georges is pictured inspecting the Boy Scouts and women workers outside the Gwyn Hall. What kind of shell? – 18 pounder H.E., shell sir. What output? – 5000 weekly. He was quoted as saying that Taylors were the first firm he dealt with when he was Munitions Minister – they had done very well – typical Lloyd George whether true or not! The press noted that the munitions workers were a smart lot in their 'neat clean overalls' [presumably washed for the occasion]. A suffragette journal described the Women’s Land Army in white tunics, munitions workers in khaki trousers and blue overalls and female tinplate workers in clogs and aprons of sheepskin, rubber or sacking. There is also brief, poignant newsreel footage of the Prime Minister outside the Gwyn Hall in apparently informal conversation with wounded soldiers with press photographers quickly deploying to capture the scene. After the formality of the freedom ceremony, the Prime Minister spoke for thirty five minutes to the select and selected, but an enthusiastic and emotional, crowd packed into the hall. Political speeches are really meant to be heard rather than read, and some of the more emotional content is perhaps difficult to square with the disappointments of the post-war period. However, as reviewed in the UK press and the Welsh papers, the speech was described variously as rousing but also meticulous and well-constructed. Winifred Coombe Tennant herself thought it was very good. Lloyd George ranged from the local context to the European stage reflecting on what he would have characterised as the ethical background to the War and the practical task faced by the Allies. There was restrained optimism; they had been in a dark tunnel illuminated by fleeting shafts of light but the end of the tunnel was drawing near. 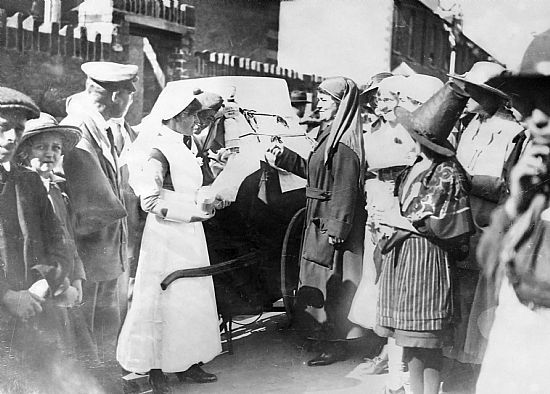 In some ways it was a very Welsh event, starting with some intended and some unintended humour, punctuated with applause and with a surefooted emotional conclusion; Lloyd George said he had met with bereaved mothers on the way down who told them what they suffered and he “had seen wounded soldiers here without limbs”. They had, he said, suffered, but in that suffering, they would conquer in the end. The ceremony ended with a vigorous and emotional rendition of Hen Wlad Fy Nhadau. 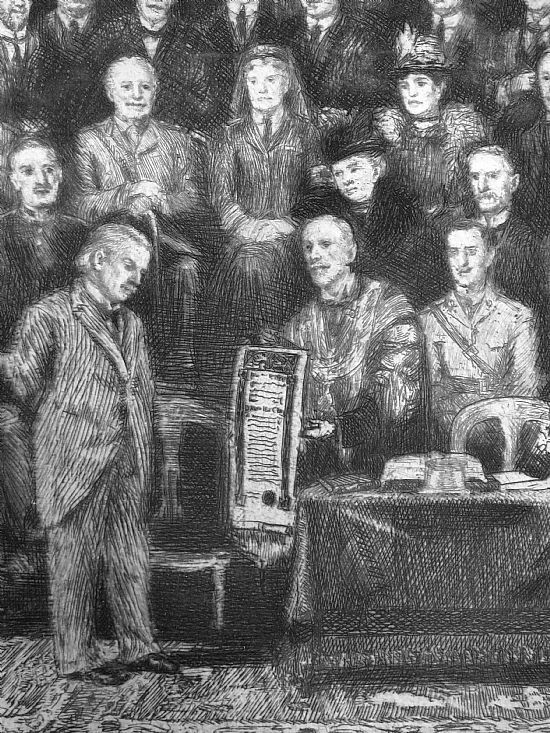 The presentation of a ceremonial scroll to Lloyd George by the Mayor Alderman Hopkin Morgan was later depicted in a large painting now housed in the Old Town Hall, Neath. This contains what are, in essence, miniature portraits of the guests of the stage party. When Winifred Coombe Tennant saw her likeness in the preparatory sketch she thought it looked nothing like her. Perhaps the Prime Minister had greater grounds for optimism than he thought at the time, though progress was bought at a terrible cost. In the four days of the battle of Amiens, there were 20,000 British and 24,000 French casualties and the total German casualties may have been as high as 75,000 Although the Allies continued to sustain heavy losses in the forthcoming months, they pushed the German forces back until the defenders reached breaking point resulting in the Armistice of November 1918. Unknown to the Allies, Ludendorf, who was the real brains of German high command, described 8th August 1918 as 'the black day of the German army' and had offered his resignation. Following the ceremony, specially invited guests dined at the Castle Hotel. After dinner the Prime Minister spoke again before going to the afternoon session of the National Eisteddfod led by a guard of honour of the women workers. The Prime Minister’s party drove out to Duffryn House to take tea with Mr and Mrs Moore Gwyn (Mrs Moore Gwyn was a strong supporter of local voluntary nursing efforts) and returned to Morriston staying overnight at Maesygwernen. The next day he was off to Newport urging colliers to maximise production of coal as part of the War effort and determined to minimise unrest in the coalfield. Calling as his witness the Labour MP William Brace, who had accompanied him on his visit, the Premier said that he had heard a lot of talk about pacifism and Bolshevism but hadn’t met any Bolsheviks in Neath. Well, perhaps some of the people outside the Gwyn Hall could have made interesting comments about some of those inside but, on the day, but the crowds were large and enthusiastic. Lloyd George still divides opinion today. The post-war reconstruction, hinted at in his speech that sunny, cautious but celebratory day did not occur. The women who got the right to vote were over 30 years of age and satisfied a property qualification; very few of young women who marched proudly that day in their working clothes were able to cast a ballot in the 1918 election, but they knew that at the time. The Liberal Wales which Lloyd George had, at one time, embodied fell apart in the post-war world and he himself was out of power in 1922. The freedom ceremony was widely reported, photographed and filmed for the newsreels of the time. At least three clips survive and some of these are posted on this website under the side tab labelled VIDEO GALLERY. Another one (produced for French audiences) can be seen using a link at the bottom of this article. Neath appears in the third segment. The town was also filmed that day for a brief sequence which appears in the silent feature film The Life Story of David Lloyd George directed by Maurice Elvey, mysteriously suppressed in 1918, but restored and reissued by the National Library of Wales in 2009. It had been a distinctive and successful National Eisteddfod, albeit one marked by war; the Welsh Guards choir competed with some honour and the Eisteddfod committee decided that the substantial sum of £1,000 of the surplus should be handed over to the Neath Corporation with a recommendation that it could be spent on a range of projects, one of which was 'a War Memorial to the Fallen Heroes of Neath and District.' Another legacy of that Eisteddfod was, of course, 'The History of the Vale of Neath' by D Rhys Phillips; a book which had its origins in a prize-winning competition essay, which he developed with the encouragement of Winifred Coombe Tennant. Much interesting material on the freedom ceremony may be found at the Neath Mechanics Institute and West Glamorgan Archive Service. Further published information can be found in an informative and lively article by Katie Millien in the West Glamorgan Archive Service Annual Report 2008/2009.